As a high-school student in the flatlands of Rockford, Illinois, where the highest objects on the horizon were water towers, Ed Viesturs read and was captivated by the French climber Maurice Herzog's famous and grisly account of the first ascent of Annapurna in 1950. When he began his own campaign to climb the world's 14 highest peaks in the late 1980s, Viesturs looked forward with trepidation to undertaking Annapurna himself. Two failures to summit in 2000 and 2002 made Annapurna his nemesis. His successful 2005 ascent was the triumphant capstone of his climbing quest. 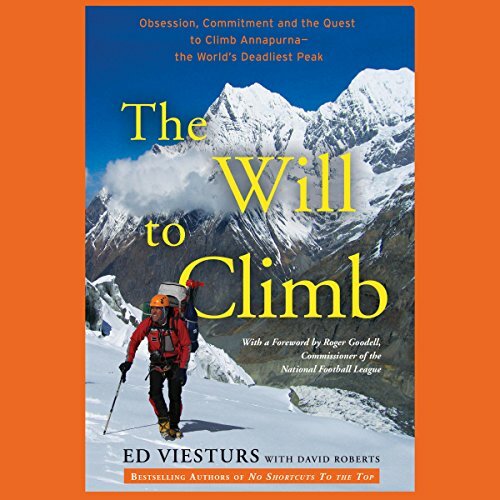 In The Will To Climb, Viesturs brings the extraordinary challenges of Annapurna to vivid life through edge-of-your-seat accounts of the greatest climbs in the mountain’s history, and of his own failed attempts and eventual success. In the process, he ponders what Annapurna reveals about some of our most fundamental moral and spiritual questions - questions, he believes, that we need to answer to lead our lives well. "Of all fourteen of the world's highest mountains, which I climbed between 1989 and 2005," writes Viesturs, "the one that came the closest to defeating my best efforts was Annapurna." Although it was the first 8,000-meter peak to be climbed, Annapurna is not as well known as the world's highest mountain, Everest, or second highest, K2. But as Viesturs argues, Annapurna, while not technically the most difficult of the 8,000ers, is the most daunting because it has no route - no ridge or face on any side of the mountain - that is relatively free of what climbers call "objective danger": the threat of avalanches, above all, but also of collapsing seracs (huge ice blocks), falling rocks, and crevasses. Since its first ascent in 1950, Annapurna has been climbed by more than 130 people, but 53 have died trying. This high fatality rate makes Annapurna the most dangerous of the 8,000-meter peaks. Viesturs and co-author David Roberts chronicle Ed's three attempts to climb Annapurna, as well as the attempts of others, from the two French climbers who made the landmark first ascent of Annapurna on June 3, 1950, through the daring and tragic campaigns of such world-class mountaineers as Reinhold Messner and Anatoli Boukreev. Viesturs' accounts and analyses of these extraordinary adventures serve as a point of departure for his exploration of themes vividly illustrated by Annapurna expeditions, including obsession and commitment, fear and fulfillment, failure and triumph - issues that have been neglected in the otherwise very rich literature of mountaineering, and that can inform the lives and actions of everyone. 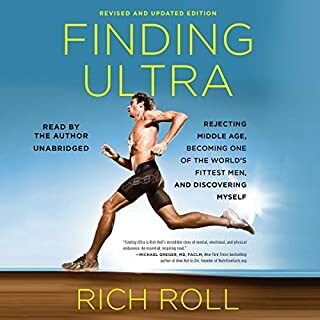 Contrary to what I I had expected after hearing reviews from other Viesturs books (that he's cocky, self-minded on the mountain, and negative towards other climbers), I did not get that sense from this book. It was a very well written account of the history of climbing Annapurna and Viesturs definitely gives credit where credit is due and highlights his own successes. It is, afterall, meant to be a book about HIS successes on the mountain. 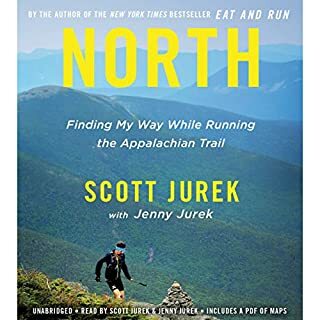 He also touches a little bit on his quest for all fourteen 8,000'ers, since Annapurna was his final one in the challenge, but I'm sure his other books go into more detail on that. The narrration is also good. Felt like I was there for many parts of it and for others, I felt as if I was reading directly from the climber's journal. I found this to be an excellent story as it tells more than just the story of the featured climb. The author does a great job of describing the history of climbing this mountain, and of the personalities of those who climb the mountains. The author was also a decent narrator, and it’s always good to hear the words from the source. Others have criticized the author for being to self-absorbed. I don’t agree. Mountaineering is, by its very nature, a relatively solo pursuit, so I think it natural for the story to reflect this. I highly recommend this read for those interested in the outdoors, mountaineering, or in the personalities and nature of those who chose to put themselves at risk. 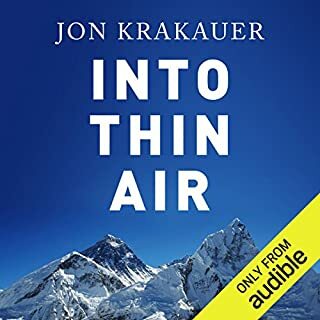 If you follow mountaineering and enjoy books written from the diaries of world class climbers then this audio book will not disappoint. Viesturs and Roberts put together a great book that reads more like a memoir than a novel and recounts the career long goal of climbing Annapurna. The deeper meaning behind the story is that we all have our own challenges in life, our own Annapurna, and with enough persistence and a little luck those challenges can be overcome. I have listened to approximately 25 books on mountaineering and enjoyed this one as much as any of the others. It's fascinating to listen to what drives various people to such great sacrifices. A great review of the peak's history. 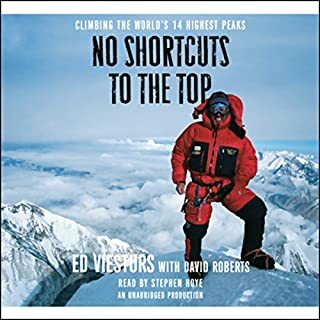 I found this book has a lot of repeat content from his previous book “no short cut to the top”; Although with many new materials added and other people’s account on Annapurna. Loved it. It is one of the great books. Great book. Lots of details about 8000'rs and mountain climbing. If you like to read about climbing, this is a must read. Great narration and a fantastic book that made my commutes supremely enjoyable. I'm an aspiring mountaineer myself and would highly recommend this to anyone who wants to get into it. 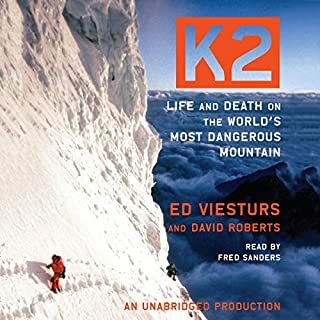 I also listened to Veisturs' other book about K2 and this one is just as good if not even better. If you like adventure or mountaineering you will love this book! Viesturs and Roberts tell another great story about Annapurna. It's not about just one expedition but about a brief history of some of the great expeditions of the mountain. If you have read No Shortcuts to the Top, you will know a majority of the stories, however, this book brings a fresh perspective to the stories. 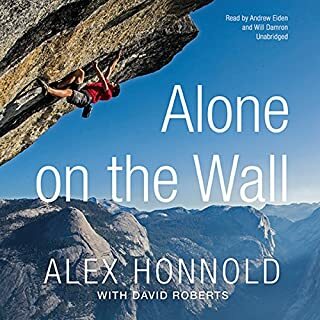 One of the best mountaineering books I've read/listened to. Inspirational and informative. Great narrator!! I wasn't sure how I would like this book due to some of the reviews I read about it but I am so so glad I downloaded it!! I couldn't stop listening to it and am listening to it again! Viestures is such an accomplished mountaineer and reading about his journeys through many challenging expeditions is truly inspiring and motivational!! I would recommend this book to everyone!! Viesters' climbing career is fascinating but the stories he tells of the other Himalayan greats are what grabbed me. The only criticism I have is that he's reluctant to offer a potentially controversial opinion of his brethren.